Magna postpones a special meeting of shareholders to comply. Magna founder Frank Stronach is ready to trim back his ties to the Canadian mega-supplier. The Ontario Securities Commission (OSC) has issued an order requiring Magna International Inc. (TSX: MG.A, NYSE:MGA) to make additional disclosures in order to proceed with its proposed transaction to eliminate the company’s dual class share structure. The deal would apparently end founder Frank Stronach’s control of the company, but at a steep price to shareholders of the common stock. 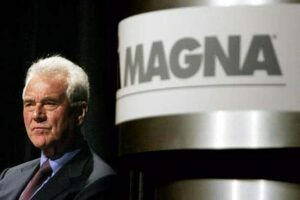 Stronach controls more than 54% of Magna shares while owning 1% of its equity. Under a Magna Board approved plan, the Stronach Trust would receive $300 million in cash and 9 million Class A shares for the Class B stock that currently gives the family roughly 66% of voting rights at the Canadian auto parts maker. The deal values Stronach’s payout at $927 million. In New York Class A is trading at about $70 a share. There is also a change in the ownership of the newly established E-Car company. It would become a joint venture between the Stronach Trust and Magna. Stronach would control the board with only 27% ownership in this potentially lucrative electric vehicle and component business. The OSC said Magna must provide additional information on how the payment to the Stronach trust was calculated, any potential alternatives considered by Magna’s special committee, the dilution suffered by minority shareholders, and a discussion of the committee’s review and approval process. “We welcome the Commission’s position that shareholders should decide the outcome of the transaction. We will work to bring the proposed transaction back to our shareholders for consideration in an expeditious manner,” said Vincent J. Galifi, Executive Vice President and Chief Financial Officer of Magna. Magna has postponed the special meeting of shareholders scheduled for Monday June 28, 2010. This entry was posted on Friday, June 25th, 2010 at and is filed under Automobiles. You can follow any responses to this entry through the RSS 2.0 feed. Both comments and pings are currently closed.